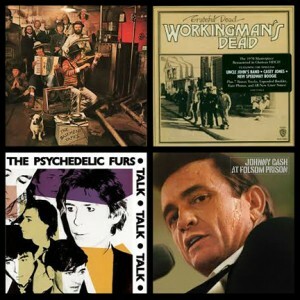 With one exception, this week’s Vinally Friday rotation is a celebration of some of the most important ’60s and ’70s era country and Americana classics. And by “important,” we mean not only are they just plain good listening, but they also made a mark in music history. Craig will kick us off with Basement Tapes, the legendary compilation put together by Bob Dylan and The Band. Though each of the 16 Dylan-voiced tracks were selected from 100 or so recorded in 1967 during his recovery from a motorcycle accident, the final cut of Basement Tapes included eight recorded later solely by the Band and didn’t hit the presses until 1975. The album is celebrated as a major shift away from rock and roll up until that point and is to this day considered among Dylan’s greatest works. Alanya’s contribution this week marks an early celebration of her big weekend plans. Saturday she’ll jam out to The Dead & Company at the Gorge;Friday she’ll spin the Grateful Dead fifth studio album, Workingman’s Dead. What’s remarkable about this 1970 release is that not only did it eschew their previous psychedelic roots, but it represented the band’s new exploration of the Bakersfield Sound. Robert will briefly relive us of the 1960s-70s with the 1981 release from English rock band the Psychedelic Furs. Talk Talk Talk, the band’s second studio album, features the single “Dumb Waiter” and introduced a “brighter, poppier side” to the band. And then Tommy will take us back again to 1968 with Johnny Cash’s epic live album, At Folsom Prison. Backed by June Carter, Carl Perkins and the Tennessee Three, this record includes cuts from two shows performed in a single day for inmates at the California prison. Enjoy the journey to the 1960s and back. Vinally, it’s Friday. It’s Vinally Friday! Only on the Trail 103.3.